The more stars a system of alien worlds starts with, the more likely those planets will orbit those stars at odd tilts, scientists say. The discovery, based on a study unveiled today (Nov. 14), suggests that even Earth's own sun may have had a companion star early in its development. In recent years, astronomers have detected hundreds of exoplanets — worlds circling distant stars. Many of these are "hot Jupiters" — gas giants like Jupiter or Saturn that are closer to their stars than Mercury is to the sun. Researchers had thought hot Jupiters arose when giant planets were dragged inward by protoplanetary disks of gas and dust falling toward stars. However, this idea was recently cast into doubt by the surprising discovery that a major fraction of hot Jupiters have orbits that are tilted in respect to their stars' rotation. Stars all spin, just as Earth's does, and their worlds often line up with this spin — they orbit around the equators of their stars and revolve in the same direction. However, sometimes alien planets have misaligned orbits instead, ones that are at slight or even sharp angles around their stars. The orbits of some exoplanets are so far tilted that they are actually backwards — they move in retrogradeorbits in exactly the opposite direction of their stars' spin. Scientists had thought if hot Jupiters were dragged toward their stars by protoplanetary disks, they would all end up in relatively normal orbits around the equators of their stars. However, astronomers recently discovered that a whopping 25 to 50 percent of these planets actually may have misaligned orbits. "The misalignments seemed to point towards a much more volatile, violent evolutionary path for hot Jupiters," said study author Konstantin Batygin, an astrophysicist at the Harvard-Smithsonian Center for Astrophysics. For instance, perhaps it was a gravitational tug of war between exoplanets that hurled some inward at their stars. Still, it seemed unlikely such processes were responsible for all these misaligned planets. "A crude and oversimplified analogy is taking a machine gun, shooting in every direction possible, and hitting the correct target about 1 percent of the time," Batygin said. "Surely not impossible, but it seems unlikely." Although the solar system has only one sun, most stars like Earth's sun are binaries— two stars orbiting each other as a pair. 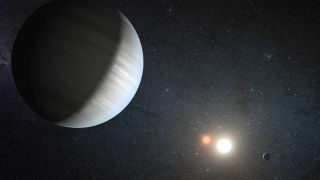 Increasingly, astronomers are discovering planetary systems with twin suns (like Luke Skywalker's fictional home planet Tatooine in "Star Wars"). There are also many three-star triples in the universe, at least one of which is known to host planets, and the number of stars a system has can even climb as high as seven. Through computer modeling, Batygin found that the complex system of gravitational pulls that binary stars exert on protoplanetary disks would disrupt them enough to misalign the disks. He added that the more stars a system has, the more likely its planets orbits would be tilted. This idea does not require that a system have multiple stars for billions of years, Batygin added. "It is generally believed that 85 to 100 percent of stars form as multiples," he said. Many times, stars then get stripped from these systems during the first 1 million to 10 million years of their lifetimes. Future research can analyze other details about the interactions between planets, their stars and protoplanetary disks. "For instance, the magnetic coupling between the disk and the host star should be looked at more carefully," Batygin said. Batygindetails his findings in the Nov. 15 issue of the journal Nature.